The 12-month full-time Point Loma Nazarene Daytime MBA program at Fermanian School of Business was created for recent college graduates. Students are encouraged to join this program either in the fall after their graduation or within two years of completing their undergraduate degree. The program offers one intake per year, and classes begin during the fall semester. Classes are structured in cohorts. Classes are held in the PLNU Graduate Regional Center at the Mission Valley campus. The Point Loma Nazarene Daytime MBA program includes 14 core courses, which spread out over fall, spring and summer semesters. In the first, students take the courses Management and Marketing as well as Managerial Economics and Leading with Integrity. In the spring semester, students explore topics such as international business and entrepreneurship. Finally, the summer semester will cover courses including Operations Management, Organizational Communication and Strategic Management. The core requirements add up to 42 credits. In addition to the core courses, students complete a “Field Experience” in the second semester. This will be comprised of joining regional and local company executives to creatively solve problems. The typical Point Loma Nazarene Daytime MBA class is typically split between those who identify as female and those who identify as male, with an average age of 23-years old. The Fermanian School of Business will charge $845 (per unit) for the Daytime One-Year MBA program. PLNU offers a variety of scholarship options, mostly through the Free Application for Federal Student Aid (FAFSA). Loans are also available as well as military programs and services. 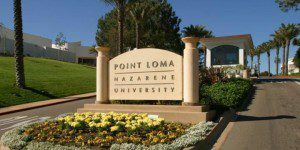 Applicants to the Point Loma Nazarene Daytime MBA programs must have completed a four-year degree or its equivalent for admission. To apply, students must submit a completed online application and a $50 application fee as well as: official transcripts; a personal essay; GMAT score; a résumé; and two professional recommendations. Students who graduated with less than a 3.0 GPA from their undergraduate program should speak with an enrollment counselor for information about applying. In certain circumstances, the GMAT may be waived. The PLNU Graduate Admissions team takes into account certain professional certificate programs, other graduate-level experience and the GRE.